A photograph is worth a thousand words. 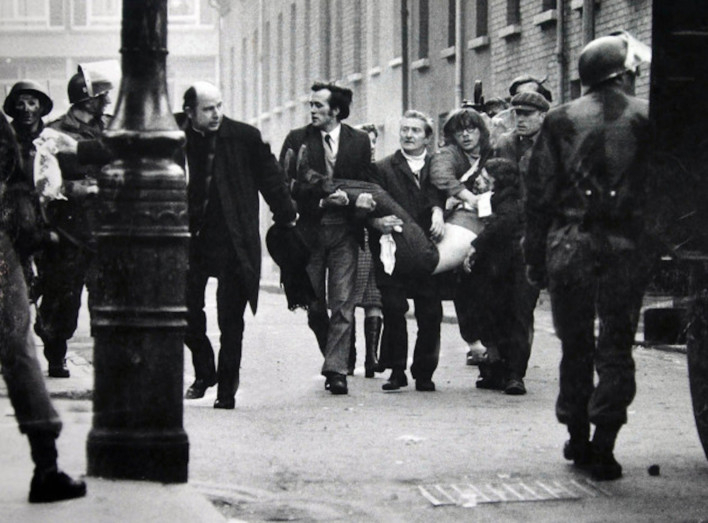 But for the generation of newspaper photographers who captured history unfolding day by day through their lenses across three decades of political and sectarian strife in Northern Ireland, they are only now being able to put the body of their work into focus. Thomas Kelly, a Dublin-based photo editor, is the producer of a moving new documentary, Shooting the Darkeness, on the work of Northern Ireland’s news photographers who were suddenly cast from covering small-town events such as cheque presentation and flower shows, to the bloody and brutal troubles that were ripping their communities apart. Shooting the Darkness was aired on German and French television in March, and is being entered into a series of film festivals in documentary categories. Both Kelly and Burke had been tossing around the idea of a documentary on the life of a photojournalist, but a chance conversation quickly turned their germ of an idea into the work that took three years to complete. It’s also rare to hear a photographer describe a picture that he didn’t capture. But that’s just what happened to Alan Lewis, recalling a Belfast bombing in 1971 at the Balmoral Furniture Company. Lewis was an eager but respectful press photographer, positioning himself beside an ambulance and away from the rescue efforts. He watched through his viewfinder as the body of an infant, dead and exposed, was carried out from the wreckage. Rather than being a strictly news or history documentary, this looks more at the craft of taking photos — and doing it in a warzone. “It’s about the guys who did this stuff. It’s about how they learned their craft; what’s a good photograph, the impact of a photograph,” Kelly says, adding that the craft of the work has changed with the advent of digital photography. Back then, lensmen had limited film and had to make every shot count, while skills in the darkroom brought images to life slowly. “A photographer was never fully being sure what was on the roll of film until it was revealed in the darkroom process,” Kelly says. Sunday morning, beautiful day, blue sky, sunshine.. and you go up and you think, ‘what time will we be finished at today?’ In Chamberlain Street, it got to about 3:30 in the afternoon and as you know, the daylight starts to go then in January. There was a mist coming and we spotted this group coming down the street, coming towards the end of Chamberlain Street. It was almost like stills from a movie, just frame after frame after frame as they got closer. When they got up really close, it was a body... of 17-year-old Jack Duddy. And it was Bishop Edward Daly waving the blood-stained handkerchief. They then left the body on the ground and and Bishop Daly gave him the last rites. And the one thing after it all starting to unroll and people had realised what had happened, the silence was the thing that you could have heard a pin drop. People were numbed and shocked, with bodies, with white cloth hanging over them. There’s even a picture I had of a medic holding his head and looking down, in disbelief. The fact that there’s a priest, and two people carrying a dead youth, and he’s waving the handkerchief, blood-stained handkerchief, that blood-stained handkerchief was what you would call the punctum. It’s that aspect of a photograph where it draws you back, you look at it once and then you move back and you go back again and there’s something that draws you into it, within that photograph there’s something and that’s the handkerchief and that’s what makes it such a powerful image. It happened basically beside me, where the soldiers were apprehended. There was a fight for the weapon, they lost that fight and they were apprehended. It became evident that if I wanted to get this story out, what was in the camera had to be taken out and hidden. New film, put into the camera, wound on, you know, reeled up, so that, if I was asked for the film, I would open the camera and rip it out and it would look like it was being destroyed. And it worked, insofar as the story got out and the images got out. It’s probably better, to view the world when you’re in a situation like that, from behind the camera. Your mental process is going through composition, when to make that decision to press the shutter. Staying behind the camera is a safety valve, to seperate yourself from sinking into the event and becoming part of it, which is what you don’t want to do. You don’t want to be part of the event. And the only real thing that you have to do is, not analyse why it’s happening, but analyse what’s happening and how to translate what’s happening into a good picture. You are that eye, you are that reporter, you are that photojournalist. They said ‘Where are you from?’ And I said ‘Right... New York Times’ and they said ‘Come with us’ and I got into the back of the car. 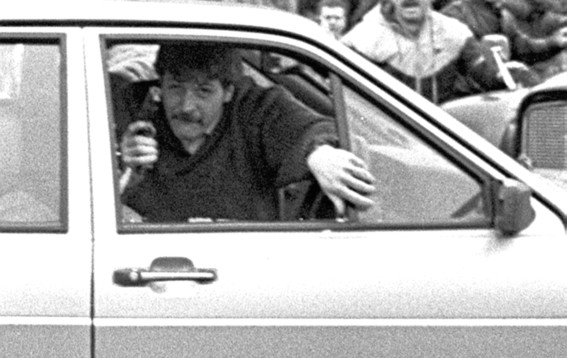 And I said ‘what’s going on?’ And he said ‘they’re not going to tell us how to bury our dead.’ If the IRA were going to do anything, they had to do it directly after it came out of the chapel. And Martin McGuinness appeared from the back of the wee chapel, and he was looking round and watching everything, what was going on, he knew the clock was ticking. And I was told to go around the back so I had a fair idea that something was up but as service was ending, the coffin was gonna come out, the [British military and security forces] Chinooks were landing. Six IRA guys appeared in full camouflage gear, wooly masks, berets, the whole lot and lifted the coffin. And McGuinness was at the front on the right-hand side. No words were spoken, I was photographing away. I was on a wide angle, and you could hear this noise, and the shouting and people were starting to break gravestones and throw them at soldiers who were trying to come through the hedge into the graveyard. And as soon as it started, I had maybe 20 odd frames and that there, I was pulled back, turned around and they were gone. The security forces had lost this one and they knew that. 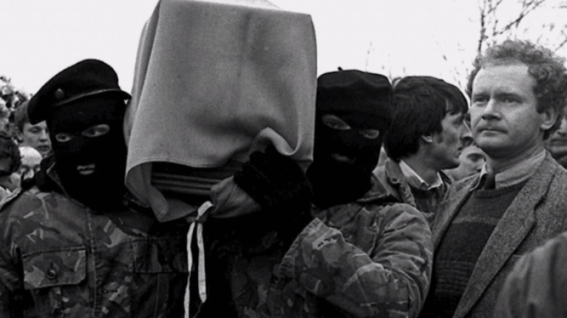 The provos [IRA] had played their ace and they’d gotten what they wanted, a nice picture of Martin McGuinness with the IRA guys carrying the coffin.